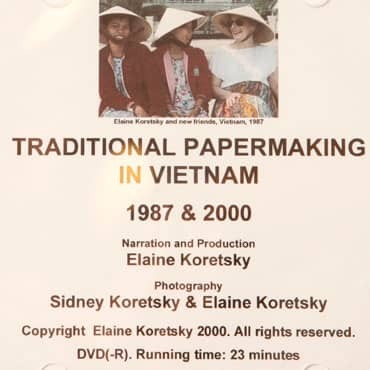 Elaine and Sidney Koretsky investigated traditional papermaking in Vietnam in 1987 and again in 2000. The film shows the status of papermaking in Vietnam at a time when the commune system was still in effect in the early post-war years, and shows the changes which occurred after its breakdown and the resurgence of traditional papermaking by individual papermakers. The pace of life in Hanoi is captured in the filming. The background music is traditional Vietnamese. Running time: 23 minutes. 1987 & 2000.